Like most hardware projects there is more then one way to implement the hardware. The hardware list is the minimum requirements to build a successful prototype. 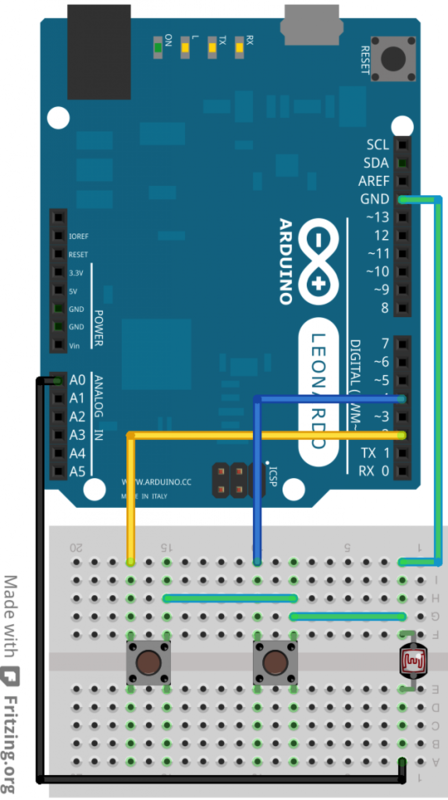 There are no resistors listed because the internal Arduino pull up resistors are being used, as a result there is a slightly higher current draw and the logic is slightly more complex. Here is the wiring diagram, as mentioned there are no resistors as internal pull up resistors are being used. The code is pretty straight forward, the state of the screen saved and the appropriate key presses will be sent. Processing code for Ardunio Leonardo and Micro to send a text string when a button is pressed. - Adapted by Gordon Turner from code by Tom Igoe. - A push button attached to digital pin 5. - 10-kilohm resistor attached from pin 4 to ground. - NOTE: Please be careful what the device is plugged into and what has focus, or bad things can happen. // Input pin for the screen toggle push button. // Input pin for the refresh push button. // Input pin for the screen toggle light sensor. // Device state, independent of button state. // Storing previous state of the screen toggle push button. // Storing previous state of the refresh push button. // Storing previous state of the screen toggle light sensor. // Set the screen toggle push button pin as an input. // Set the screen toggle light sensor pin as an input. // Set the led pin as an output. // Start up the keyboard. // Read the screen toggle light sensor and set initial value. // Read the screen toggle light sensor. // Read the screen toggle push button. // If the button state has changed. // Turn the led on to indicate button press processed and key combination sent. // Save the current light sensor state. // Wait for a second, blocking more button presses and then turn the led off. // Save the current button state. // If the refresh button state has changed. // Send a control-r key combination. // If the light level has changed enough, toggle the device status. // Send a WINDOWS-0 key combination. Plugin and test on Raspberry Pi.